Advanced UAV mapping and remote sensing technology. UAVs (unmanned aerial vehicles), or more commonly known as drones, offer advanced opportunities for land owners. Whether you are managing a large tract of commercial timber or managing a large restoration, there is drone technology for you. NDVI technology is a simple graphical indicator used to analyze vegetation health. This technology assess whether the target being observed contains live green vegetation or not. Using this tool we can quickly and efficiently analyze large areas of land for growth deficiencies. Observing forest health is performed quickly and at a low cost with remote sensing. By first flying an area, performing an NDVI scan, we can identify areas of concern. These areas we can travel back to on foot and investigate further. What better way to memorialize your landscape than with a picture? From the air. 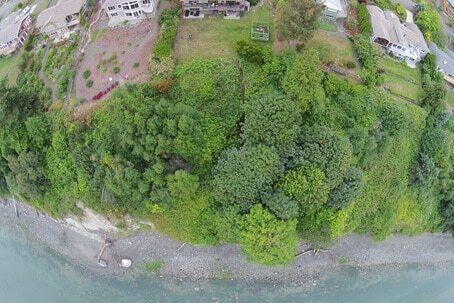 Often we use our drone for landscape design purposes. Monitoring contingency plans and restoration plans is performed effectively by a UAV/Drone. Rivers and shorelines, where foot access can be difficult, are both crucial ecological landscapes and difficult to monitor. Using remote sensing we can visually assess restoration sites quickly and efficiently.